Isn't celery mostly water? Yes, but it is chocked full of other great nutrients. It has protein, Vitamin K, and lots of other vitamins to keep you going. Clinical studies show it significantly reduces the blood pressure by relaxing the muscle tissue in artery walls and thus enhancing blood flow. As a kitchen medicine, celery is also used for constipation, as a diuretic, to break up gallstones, relieve liver congestion, and to heal wounds. How many foods can do all of that? 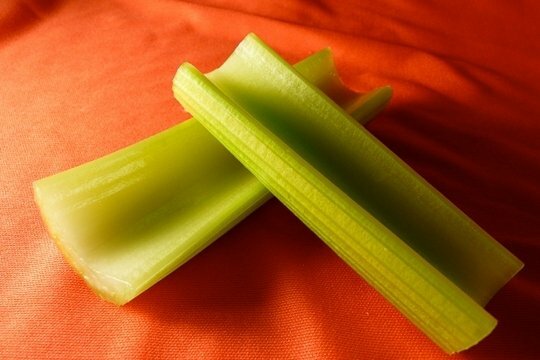 Celery is a really low calorie and nutritious snack. You can buy it and cut it up yourself or you can find it pre-cut for you at the supermarket. If you don't like plain celery (and most people don't), try out some dips. Even though you are adding calories, you are still getting the health benefits of celery. This is a much better choice than eating potato chips. For a kid friendly dip, you could use a nut butter or a light cream cheese with some jam mixed in. Kids LOVE to dip their food, and you could put out different dips for them to choose from (even more fun!). Most of us think of blue cheese (or bleu cheese) dip as a great combination for celery. For those of you on a diet, try this recipe for a lighter version of the classic. Just mix up the yogurt and the cheese. Add a little salt to get to the place where you like the taste. You are essentially replacing sour cream with yogurt. Sour cream would be used to make a more conventional blue cheese dressing (and a much more fat filled one).